What is the relative scale of the My Little Pony universe? Quite simply, how do the people(?) and things in the MLP universe compare to real-world equivalents? Are the ponies the size of people, or RL ponies? Or smaller/bigger? How about things like trees or houses? In Hearth's Warming Eve, Twilight said, "I spy an 8 foot candy cane." Scootaloo was standing next to it. Comparing Scootaloo and the candy cane together, we can estimate that she is about 3 feet tall. Adult ponies are slightly taller, I estimate 4 feet. Because the ponies are in the same proportion to houses, trees, etc. in their world as we are in ours, it can be assumed that these things were shrunk down for proportion. As of Pinkie Pride, we have another scale to go on; Cheese Sandwich stands against a height chart. Instead, you need to measure from the animal's back to the ground. In the case of horses, the standard is to measure from their withers, a bony ridge between their shoulder blades, right at the base of the animal's neck. (In fact, this is the standard for measuring dogs, too, so we could use it to get Winona's height!) Unfortunately, MLP ponies aren't rendered with withers, so we have to estimate. The point on the back where the neck and back meet is good. Finding Cheese's withers in the first image is difficult, since he's facing the camera. The withers are actually slightly higher than the rest of a horse's back, but MLP ponies don't have one. The Mane Six may-or-may-not be fully grown. There are certainly adult characters taller than them. The pony-vs-miniature-horse distinction is based on what's normal for the breed, not an individual specimen. 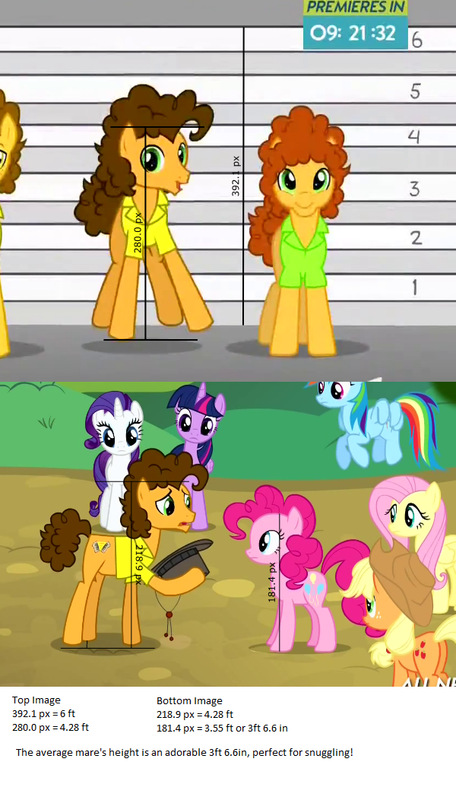 Pinkie's measurement above may be under the minimum for "pony," but she might also just be short. I found this when browsing around. I hope it helps. Most objects seen in Equestria could be arbitrarily big or small, and the show staff often play fast and loose with measurements. But one thing you can't change the size of is a musical instrument. 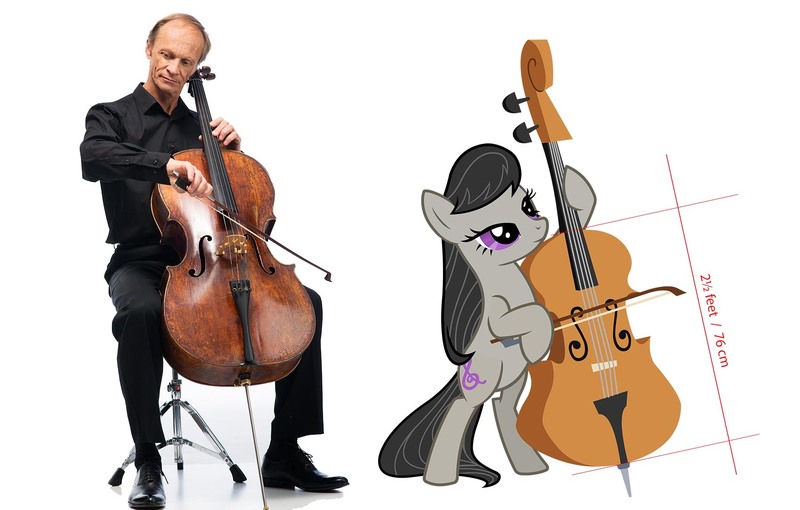 If Octavia's cello was smaller than a standard cello, it would produce a different sound. Her un-pony-like stance makes this a bit harder to measure, and Octavia may be smaller than the average earth pony mare, but it appears to suggest a height of about 60cm at the withers, or about 6 hands. This is only a little smaller than the 7 or 8 hands suggested by other methods. In equestria girls human fluttershy is shown with a rabbit and if you compare witha scene of fluttershy with angel you can see that ponies are about half the hight of an average teenager. The perspective and movement in this shot make a direct comparison harder, but let's estimate anyway. Twilight Sparkle has the most normal stance of the six in both frames. Her height as a pony is about 110px to the withers and 225px full height, while her human form is about 350px. If we assuming her human height is 1.62 metres, the average for an American teenage girl, that makes her pony form about 50cm to the withers, or 5 hands; and her full height as a pony 1.04 metres, or 3 feet 5 inches. This is smaller than the other estimates. There are several unproven assumptions in this method though. I still favour the cello method. It is worth noting that the bloopers are non-canon, but they're from about as official of a source as you can get (officially released, fully-animated content from DHX), and I don't see any reason why the animators would alter the relative size of the characters just for this scene. Additionally, this size seems consistent with what has been suggested by the other answers to this question. There is a video that finds the actual height of the ponies. They're about four feet tall. So we now have 3 strong hints at the roughly 120cm (4ft) size, including the head. Assuming this is correct, Equestria has insanely high gravity - more than the gravity on Jupiter! There's a video investigating that which I tried to debunk but ended up mostly confirming, see here for both the original video and my (hopefully more credible) calculations. So we've calculated Equestrian gravity assuming 4ft size; but what if we try the reverse - assume Earth-like gravity (g=9.8m/s^2) and try to calculate size? Using my previous gravity research and assuming Earth-like gravity, Spike's spectacular jump into the lava was merely 3 meters high! The highest point of the jump measures 16 Spikes, so one Spike is 300/16 = ~18cm, or 7". That puts mane 6 at just 25 cm or at about 10" tall, including the head. Unfortunately I can't tell if it's the ponies that are really small or if it's the gravity in their world is so insanely enormous. But either way, the "human transported to Equestria" fanfics are not credible: the human would either be crushed by the enormous gravity, or turn out to be just too damn huge compared to the ponies. If the latter is true, perhaps the human should try to hang out with dragons instead? They're more their size! darthbobcat attempted to answer this in a 2011 forum post, and found that they are quite small as real world ponies go. He based his measurement on the size of cows. Let me quote parts of that post (bolding mine). Since the dawn of Friendship is Magic, we have known that our little ponies are, in fact, little. But how little? The problem has been what to use as a baseline. Trees don't have a set height. Items in their houses would, of course, be scaled to their size. Dog breeds, bunny breeds and cat breeds vary in size. And then I realized my point of comparison. The cows that Applejack deflected from trampling Ponyville have the coloring of Holstein cattle. That means we know the breed! According to Wikipedia, a Holstein cow, at maturity, is about 58 inches (147 cm) at the shoulder. Where you measure the cow at the hip is roughly equivalent to the height of its front hoof to the top of its back. And Holsteins have a fairly flat back. Rounding up, Applejack is the size of the smallest individuals OF THE SMALLEST PONY BREED IN THE WORLD. So the answer is: they are very little ponies indeed. The two illustrations are screenshots from S1 E4 and S2 E18 respectively. 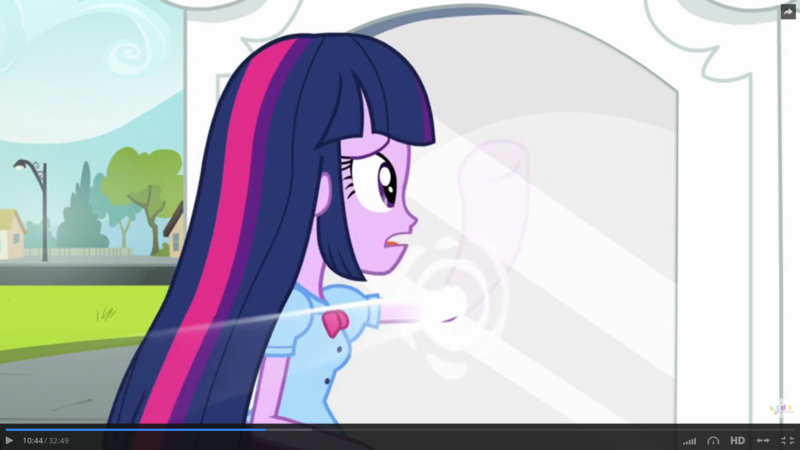 Another one from the Equestria Girls movie, where Twilight puts her hand through the portal and her arm is transformed. Good luck getting an accurate scale from it, though. This is some impressive math. I have a hard time figuring out how big ponies are myself. As a cartoonist I go by how many heads tall. The mares and stallions all have started out using the same basic body shape, three heads tall. They have regular deer as seen in Filly Vanilli. The doe is four heads tall. Fluttershy's forehead brushes the doe's chin. Compare that height to the whitetail deer around hunting season that range from 62 to 87 inches. I like to think this. I think a regular mare is 4 feet 5 inches, more or less because not everyone is the same height. I think a filly (the cmc for example) is about a foot shorter, at around 3 feet 5 inches, a little more or less possibly. Fancy pants, Luna, Fleur de lis, Sassy saddles, Cadence, and other ponies like that are probably around 5 feet. I think celestia would be about 7 feet including her horn. I also made a picture and journal explaining the height of wings and horns. If you want to read the whole thing here is the link. This shows how big wings and horns are, while this one shows how big the ponies themselves are. Just to shorten it, a filly's horn is 5-7 inches, an adult's around 9 inches, Fleur, Luna, Cadence, Fancy pants etc. have a horn of around 14-16 inches, while Celestia's is 21 inches. For the wings, a filly's is a little less than a foot at about 10 inches. 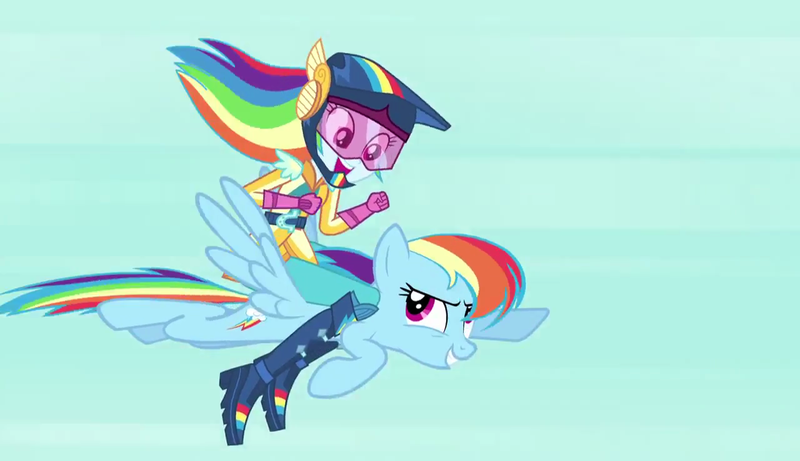 For an adult pony, wings are 27 inches or 2.25 feet. Luna and Cadence's wings are around 33 inches (almost 3 feet). And Celestia's wings are a whopping 45 inches, which is almost four feet. I just saw this yesterday. The average MLP pony is about the size of a large domestic cat when aged to adulthood. Foals around the age of the CMC are about half that size. Stallions are slightly taller than mares, but no significant difference, to me at least. Now, we are going to look at Celestia's height. Celestia is two times the size of an average pony if I'm not mistaking it. If what I'm saying is true, than even if I'm counting her horn, Princess Celestia is half the height of the average adult human being. I know you are telling me 'ponies are bigger than that, deal with it', and stuff like 'but ponies are not cat-sized'. And yes, I know of Equestria girls bloopers and all that, and bloopers are not canon. And between us, I do not think that the 'humans' of Equestria Girls are not humans at all. It's okay to have your own opinions, but don't pick on me because of my opinion. Not the answer you're looking for? Browse other questions tagged my-little-pony-fim my-little-pony or ask your own question. Is Pinkie Pie psychic in My Little Pony:Friendship is Magic? What is the weight of ponies of the My Little Pony universe? Do mules or hinnies exist? In the Optimalverse, why must the virtual form of the “emigrants” be a pony? Why does Princess Twilight Sparkle's castle lack guards and other servants? Who is the green bearded painter unicorn in S6 E4 “On Your Marks”? Are these songs from “My Little Pony: Friendship is Magic”? Were Celestia and Luna born as alicorn? Do we know if mares outnumber the stallions in Ponyville?